What's Best RC Airplane for a Beginner? Are you looking for the best RC airplane to learn with? With your new found interest in this hobby I know you have been looking at all the different RC airplanes available. There are some awesome planes out there including 3D planes, warbirds, and even jets! Full-scale pilots don't learn to fly with an F16 fighter jet! Pilots generally learn to fly with a stable more forgiving airplane such as a Cessna. Flying RC airplanes is no different. To be successful, the best RC airplane to learn with must also be a stable and forgiving airplane. There are tons of high quality beginner RC airplanes to learn with. Just because these airplanes are stable and forgiving doesn't mean they're not completely awesome to fly! There has never been a greater variety of affordable radio controlled airplanes available for beginner pilots! In the past if you wanted to learn to fly an RC airplane you had little choice but to join a flying club to get the needed assistance from experienced flyers to be successful. If you plan to learn to fly a nitro-powered airplane, getting assistance from an experienced pilot remains a necessity. If you don't have access to, or simply do not have the desire to join a flying club, there are now many types of Park Flyers available for you to learn with. Park Flyers are small electric powered planes. They are much more durable than large balsa models. They are also much safer so they can be flown most anywhere such as parks or parking lots. If you plan to join a club or have an experienced pilot teach you to fly then the best RC airplane to learn with is a trainer. Learn why trainers are the best RC airplanes for beginners. Check out the most popular RC trainers! Do you plan to join a club? Where do you plan to fly your new airplane? Plan to join a club? If there is a flying club near you, please consider joining. You'll meet tons of people that share your interest and they will go out of their way to help you. Joining a club will also give you access to a nice, safe, flying area. 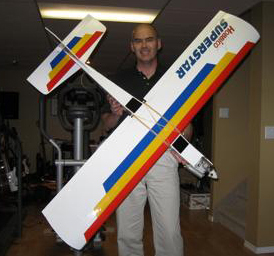 As I stated above, if you plan to join a club then a trainer is probably the best RC airplane to learn with. They are much larger than park flyers and require much more space to fly. Remember, these trainers are made from balsa wood. So you can only crash them once! That's why it is imperative that you join a club to get the help of an experienced pilot! Do you have your heart set on flying a trainer or balsa airplane but live in a remote area with no access to a club? Many people start with a park flyer for learning the basics and then transition to a balsa plane. This can be done without assistance, but it always remains a good idea to get an experienced pilot to assist you with your first flight with a standard trainer airplane. Where will you fly your airplane? While Park Flyers can be flown most anywhere, this is definitely not the case with trainers! Trainers are much larger than park flyers and take a much larger area to fly. These planes are also very dangerous! If a standard nitro trainer were to get out of control, it could easily hurt someone very seriously. In extreme cases it could kill someone. You do NOT want that liability. If you don't have a good open area on private property, and do not have the means to join a club, then the best RC airplane to learn with is a Park Flyer. These little guys can be just as fun as the big boys! With a park flyer, everything you need usually comes in the box. You charge the batteries and go fly! Trainers are different animals. With a trainer you can choose the type of power source and install your own radio system. Trainers can also be purchased with various levels of assembly required. 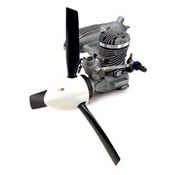 A trainer can be propelled by a nitro-powered engine or an electric motor. One is just as good as the other, each having their pros and cons. I can't say whether an electric plane or nitro plane is the best RC airplane to learn with. What type of power source to go with is strictly your personal preference. Nitro powered engines are very messy. Your model will be covered in oil after each flight. And there's no doubt that the engines can be temperamental at times. But when that four stroke comes screaming by sounding like a REAL airplane, it makes it all worth it! The great thing about nitro engines is you don't have worry about charging a battery after every flight. You just refuel and go! You can get several flights in before your transmitter or receiver batteries need to be changed. The engine to the right is an Evolution Trainer System that is specifically designed for a trainer airplane. With the recent technological advances of batteries and motors, an electric airplane can do just about anything a nitro airplane can. Electric planes are much cleaner and normally less of a headache to get them in the air. One drawback with an electric plane is that you have to charge the batteries between each flight. If you choose to go with electrics, a spare battery is a must unless you enjoy spending most of your time watching the red light blink on your charger! The best RC airplane for you to learn with depends on how much time and effort you have available to assemble it. The more time and effort you put into assembling your airplane, the more insight you will have when making repairs. On the same token, the more time and effort you spend assembling your airplane, the more heart broken you will be if it crashes. This is also a personal choice and you have three types to choose from. Do you want to get a plane that has the least amount of assembly required? If so the best RC airplane for you is an RTF RC airplane (Ready to Fly RC Airplane). These planes have the radio and engine (or motor) already installed and ready to fly! Do you want to spend some time putting your model together so you have a better idea how everything works? Do you want to custom choose your radio and engine (or motor)? The best RC airplane for you is an ARF (Almost Ready to fly) airplane. ARF RC airplanes typically take three to four evenings to put together. My trainer came in the box to the right. An ARF requires you to glue the wing halves together and glue the horizontal and vertical stabilizers to the fuselage. 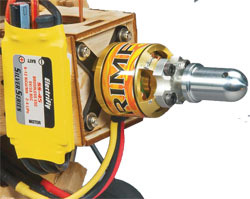 You have to install the fuel tank, servos, receiver, push rods and hardware. You also have to install the engine (or motor). It sounds like a lot of work, but it's really a lot of fun to put one of these together! 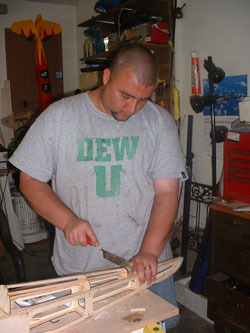 Do you want to build your model from pre-cut balsa wood pieces? Then get a kit! Some of the best RC airplanes out there are only available in kit form. With a kit, you build your airplane from the ground up. You even get to customize the airplane's covering! This is a picture of my first kit, the Sig 4 Star. It's sitting next to the box it came in. This will give you an idea of how much work is involved, and this is one of the easiest kits out there. It can take weeks or even months to complete a kit. But the satisfaction you get from seeing your creation fly is worth every second!